How-To: Make a reservation with a cafe that requires you to sign up with a Hubsynch account and make a reservation! This is a question we get asked a lot but is too big to go in our FAQ. BOX CAFE&SPACE is a common host venu that uses this system. BOX CAFE&SPACE are basically empty venues that hosts limited time collaboration café events in Japan. For each venue they take their hollow shell of a building and transforms everything to theme with the current event! They have various locations around Japan such as HARAJUKU BOX CAFE&SPACE, OMOTESANDO BOX CAFE&SPACE, SHINJUKU BOX CAFE&SPACE etc. and they all use the same reservation system. Their cafés usually always require an advance reservation to visit and you must make your reservation at least 3 days before you intend to visit. If you simply walk-up without a reservation you may not be able to be seated at one of their locations. However BOX CAFE isn’t always the only venue that uses this system. 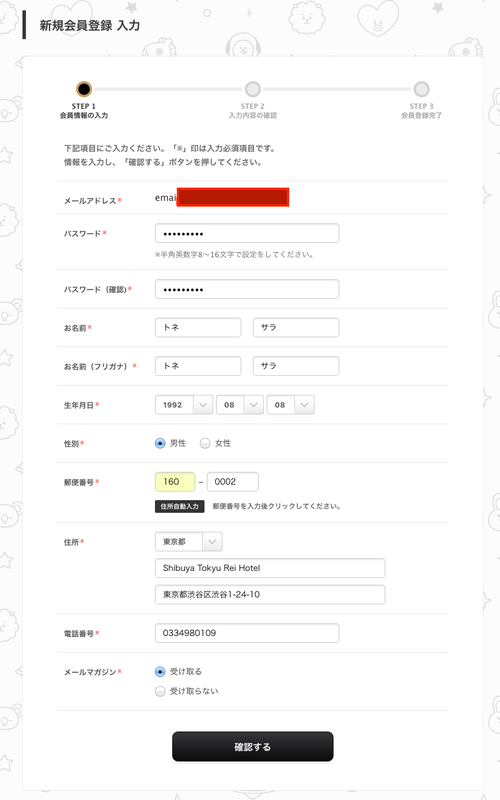 Understandably their reservation system seems a bit complex for non-Japanese but no worries! We will try to help you out with our guide! This guide was written on August 7, 2018. It may be outdated eventually or the process may change at any time. If you notice anything different please let us know in the comments so we can update our guide! Additionally we used BT21 Café for our guide so specific information may vary such as times, reservation fee's, maximum party limit etc. We recommend using a language translator such as Google Translate to help assist you as you go along. It actually kind of works with this website if you need it. THIS COMPANY DOES NOT MAIL OUT ANY PHYSICAL TICKETS. Everything is purely digital and we will go over this more in detail further in the guide. In order to make a reservation you will first need to create an account with hubsynch. This is the part most people seem to have trouble with as non-residents of Japan. This service is how you'll manage your reservations and other companies also use this service as well. If you already have an account please go ahead and log-in on the café page and skip to step #2. The first step in account creation is accepting the Terms of Service (TOS) for hubsynch. There's a lot of information in the TOS to translate so we recommend using a translator tool to get the general idea. It's never recommended to agree to something you do not understand. To agree you will select a button that looks like this: 上記各規約に同意の上、会員登録へ進む. Once you accept the TOS you'll be taken to a page that looks like the following where you'll input your e-mail. PLEASE use your own e-mail and not a fake one or at least an email you'll have access to to receive your confirmation e-mails. Input your e-mail on this page. Next is filling out your personal information. We have an original copy with what we filled out + Translated version. We blocked out the tester email account that we used. * Please set it with 8 to 16 letters. Your name (Last name, First name): We've found it best to use katana both times for foreigners. If you don't know the katakana of your name you can try the fake name we used; Tone, Sara. In our experience no one verified the name & address for the hubsynch account. Your name (phonetic): We found it best to just type the name in Katakana for both fields for foreigners/tourists. Birth date: Your birthdate here. The birthday you see here is a random one for the sake of writing this article. For the address &phone number you may try using your accommodations address such as your hotel or airbnb. If you're not staying at a hotel where you can look up the address try a random hotel. Again in our experience they did not verify this but it is still at your own risk. Once you finish that page you will be taken to a confirmation page where you will verify all the details. 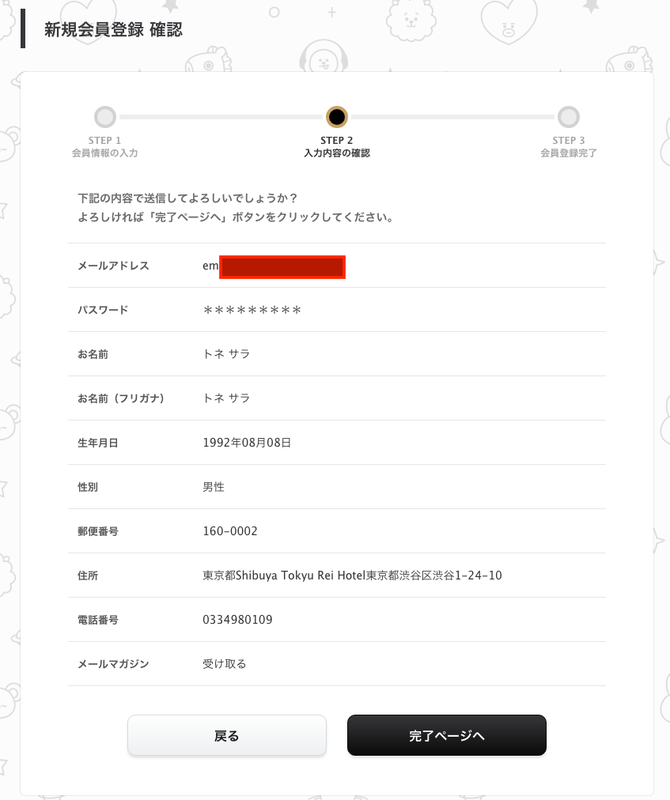 Once you review everything click "完了ページへ" and your reservation will be complete! Once you have successfully created your account you will go back to the cafés webpage and log in to make your actual reservation! This is the following terms that they usually display before making your reservation. These terms might change slightly between collaborations so please attempt to double check with Google Translate (or your preferred language translator) or leave a comment below if any information is different and we'll try to assist you. Reservations will be accepted until 3 days before each opening day. You only need 1 reservation application for up to 4 people. Select the month you want to visit at the top and then find the day you wish to visit. Click on the (+) located on the right of the day to pull up the available or unavailable time slots. As you can see below: there are no available seats for 9/01 but plenty for 9/03. Once you select your date & time please verify it on the next page. PLEASE be sure to verify the date & time. Review the associated reservation fee (please note the price you see here may be different than the price at other cafés. We are using the BT21 Café in our examples.) and lastly select how many people will be eating with you (Note that the reservation fee is per person). Once you select the cart button you'll be taken to another page where you will confirm AGAIN that everything is correct and enter your payment information. After you complete your payment you will be charged immediately for your reservation. Once the charge goes through your reservation is complete! Visiting the café with your reservation. This part requires internet connection! They DO NOT physically mail you a ticket and you cannot screen shot your confirmation either. When you visit the café you must go into your reservations/orders on your phone through the cafe website and pull up your reservation directly. They will digitally stamp your reservation in person. The technology will not work with a screenshot. Staff is on hand and will show you how to pull up your information if you need help. They also tend to have directions printed out to follow along. We hope this helps! Be sure to leave a comment if you have any questions! Changes to Navigation + New FAQ page!